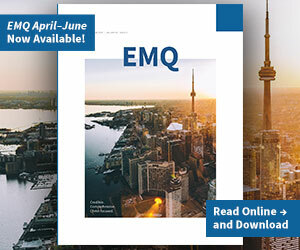 The just released April-July 2019 edition of Evangelical Missions Quarterly (EMQ) features Canadian missions exclusively – and for good reason. Canadians have exhibited untiring missionary zeal for nearly two hundred years of engagement in foreign missions. Granted, there was much missionary activity within Canada early on, especially among indigenous peoples. Then just before the middle of the nineteenth century, missionaries began to go globally. In 1845 Richard Burpee went to India with support from Maritime Baptists. In 1846 the tiny Presbyterian Church of Nova Scotia sent John Geddie to the New Hebrides. Others quickly followed. Goforth was a Presbyterian missionary to China with the Canadian Presbyterian Mission, along with hiswife, Rosalind. He became the foremost missionary revivalist in early 20th-century China and helped to establish revivalism as a major element in Protestant China missions. Mackay was the first Presbyterian missionary to northern Taiwan. He served with the Canadian Presbyterian Mission and is among the best known Westerners to have lived in Taiwan. Jaffray was a missionary to China, Indonesia, and several other countries with The Christian & Missionary Alliance. He served as the founding principal of the Alliance Bible Seminary in Hong Kongand was principal contributor and editor of the Chinese language Bible Magazine. He died at age 72 in a Japanese concentration camp in Indonesia. Isobel a.k.a. “Belle,” was a Canadian missionary to the Lisu people of Yunnan Province, China, and northern Thailand. She served with the China Inland Mission (OMF today), along with her husband, John, as a Bible translator, church planter, Bible teacher, evangelist, and authored nine books about her experiences. Three of her best known are: Green Leaf in Drought Time, In the Arena, and Stones of Fire; all of which impacted me as a student. Susanna “Susie” Carson Rijnhart, was a Canadian missionary medical doctor and Tibetan explorer. She was the second Western woman known to have visited and even lived in Tibet and was anindependent and adventurous woman. She and her first husband, Petrus, never joined a mission agencyand lived a very frugal life filled with hardship. Bingham was co-founder, along with Canadian Walter Gowans and America Thomas Kent, of Sudan Interior Mission (SIM today). Read Gary Corwin’s compelling article “Walter Gowans and Rowland Bingham: The Spirituality of SIM’s Canadian Founders” to learn about these missionary pioneers and the spirituality that drove them. Don Richardson was a Canadian missionary (born on Prince Edward Island) with RBMU (World Team today. He was a teacher, author and international speaker who worked among the tribal people of what is Papua, Indonesia today. He is known for his impacting books: Peace Child, Lords of the Earth, andEternity in Their Hearts. In this edition of EMQ, every contributor (except Corwin, who features Canadians Bingham and Gowans) is Canadian. They present current thinking pertaining to missions both in Canada and beyond. With this edition it is our hope that Canadians will be encouraged by current missiological thinking going on in their particular circle, and non-Canadians will gain a deeper appreciation for the contributions Canadians are making to global missions.